Jatropha is an oil-bearing plant growing in tropical and subtropical regions of the world within 30°N and 35°S latitudes. It is considered as a potential solution to the prevailing shortage of fossil fuel and environmental challenges. However, in most parts of Africa including Ethiopia, traditional land allocation systems for biodiesel investment do not involve integration of multiple variables. 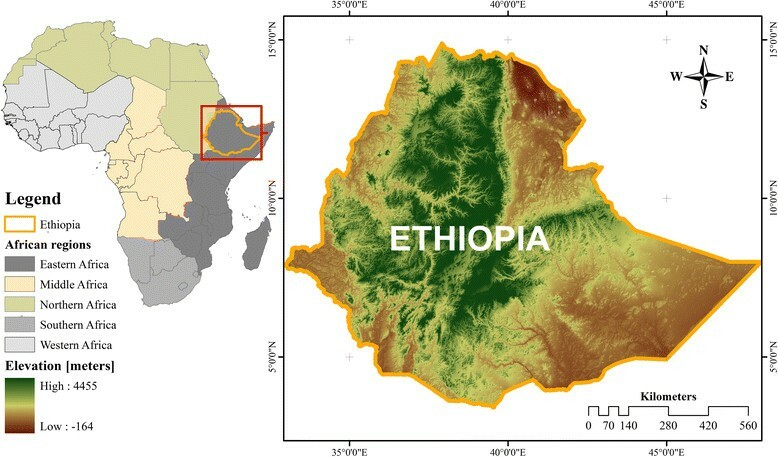 This research tries to introduce the advantages of Geographical Information Systems (GIS) and Spatial Analytical Hierarchy Process (SAHP) to identify suitable areas for jatropha production in Ethiopia. Combination of these methods enables integration of different environmental data in a multi-criteria analysis. The study will provide basic information in the biodiesel investment, which has been susceptible to failure due to poor land allocation. The methods used in this study will also be available for similar endeavors in the future. In general, although individual factor evaluations provided varying amounts of suitability, results of weighted overlay analysis for biophysical suitability evaluation using spatial modeling methods identified 15.07% (166,082 km2), 76.57% (844,040 km2) and 8.36% (92114 km2) of the land as highly suitable, moderately suitable and not suitable for jatropha production, respectively. The methods used in this study provided considerably reliable estimate of suitable sites for jatropha production in Ethiopia. In this study, the main limiting factors of jatropha production identified were elevation, climate (temperature and rainfall extremities) and water logging conditions. Suitable sites do not compete with existing land use systems ensuring that biodiesel production will not risk food security programs. Located in the horn of Africa, Ethiopia is the second populous country in the continent with an estimated population of about 89.2 million in 2013 (PRB ). Its energy demand is increasing tremendously and cost of petroleum import exceeded export earnings by 2008 (NBE ). Recently, declining trends in the global energy supply and consequences of climate change have created huge global concern. Due to this huge concern, many countries are making efforts in developing clean energy options (Van der Putten ; Achten et al. ; Wu et al. ). In Africa, for instance, high fossil fuel prices and national security concerns have sparked interest in bio-based fuel development in different parts of the continent (Koikai ; Pillay and Da Silva ; Nyebenge et al. ). Ethiopia has designed a biodiesel development strategy to promote biodiesel investment. The strategy will help the country evade its reliance on import of fossil fuels for its energy consumption and reduce impacts of climate change (CRGE ; Nyebenge et al. ; Makkar and Becker ). Jatropha, palm tree and castor bean were identified in the strategy as promising biodiesel bearing plants. This paper was inspired by the multiple products and services obtained from jatropha to ameliorate land degradation, negative energy balance, fertility loss and poor health condition of the rural community (Brittaine and Lutaladio ; Grass ; Heller ). Jatropha curcas L. is an oil-bearing plant growing in the tropical and subtropical regions of the world within the limits of 30°N and 35°S latitudes (Jongschaap et al. ). The plant belongs to the Euphorbiaceae family and sets fruits that contain seeds with an oil content of more than 30%. Some survey reports, estimates (using conventional methods) and author’s personal observation revealed presence of jatropha around home gardens and farmlands in different regions of the country. Plantations were also established by different actors; however, the methods used so far for site identification were ineffective (Nyebenge et al. ; Wendimu ; MELCA ). Consequently, failure accounts of investment projects have been reported (Wendimu ). The conventional techniques of identifying marginal land for jatropha investment lack scientific foundation (Wendimu ) and decisions were dependent on old data (Birega et al. ). This study employs Spatial Analytic Hierarchy Process (SAHP) and Geographic Information System (GIS) to generate valuable information in land allocation for jatropha production. SAHP is a derivative of Analytic Hierarchy Process (AHP), which is used to resolve highly complex decision making problems involving multiple factors (Saaty , Saaty and Vargas ). Its spatial equivalent, SAHP, is now becoming an emerging tool for multi-criteria analysis in which positional relationship between features is relevant (Ghamgosar et al. , Emami and Zarkesh ). SAHP was used by several researchers for land use site selection due to its paramount advantages. Some of the special features of SAHP were explained by Emami and Zarkesh () as the ability to review both quantitative and qualitative criteria simultaneously, the possibility of simplifying complex issues into a form of hierarchy, pair-wise comparisons and weighing criteria, simple calculations and possibility of ranking the final options. It also works well with various factor weighting and quantifies experts’ opinions (Zarkesh et al. ). A combination of SAHP and GIS has been used in determining suitable areas for rangeland management (Jafari and Zaredar ), ecotourism (Zarkesh et al. ), municipal solid waste landfill (Javaheri ; Paul ), and forestry (Store and Kangas ; Babaie-Kafaky et al. ). This implies these methods can be customized to specific features of a particular field. Spatial modeling technique is a useful method of overlaying multiple datasets in a GIS to assess suitability (Duc ). Generally, there are two approaches to model ecological suitability; namely, correlative approach and mechanistic approach (Figure 1). Correlative habitat models identify distribution of a species with environmental data like soil, temperature and topography. Examples of correlative habitat suitability models include BRT (Boosted Regression Tree), MaxEnt (Maximum Entropy), and CART (Classification and Regression Tree) models, which rely on occurrence data. 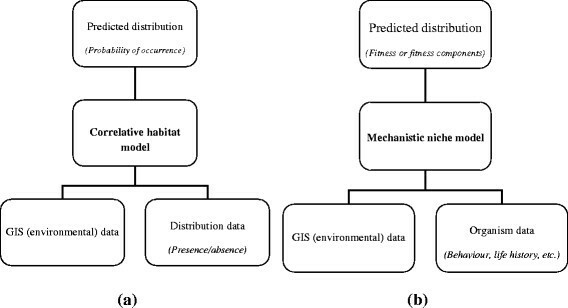 These models are appropriate to identify habitat requirements of a species (Valavanis et al. ) and relate that with a larger landscape dataset. Two approaches for modeling habitat suitability: (a) correlative modeling, and (b) mechanistic modeling approaches (adopted from Kearney). Mechanistic habitat suitability model, on the other hand, is used to determine the mechanistic link between an organism’s environment and its fitness with the environmental conditions (Kearney ). It generates information about conditions in which the species can ideally persist based on observations made in laboratory studies or documented realities. This study uses a mechanistic suitability modeling approach since it deals with a plant whose environmental requirements are well documented. The approach is adopted from FAO (). Findings of this study will have paramount significance in supporting decision making in the biodiesel energy development sector. Local communities, universities, investors, researchers, community-based organization (CBO’s) and non-governmental organizations (NGO’s) will benefit from the research results. The research idea was originally derived from information requests from different actors since previous estimates were neither accessible nor dependable. Availability of this publication will answer those questions of partners and serve as an alternative source of information. The methods used in this study will contribute to replacing the existing ineffective ones; and will be useful for future efforts of research and development initiatives. Therefore, specific objectives of this investigation were to identify factors and select criteria of growth and yield requirements of jatropha, classify and weigh environmental variables into different levels of suitability, and produce a suitability map for jatropha production in Ethiopia. The factors presented in Figure 2 were identified as important criteria influencing jatropha production. They influence the amount and quality of products derived from jatropha, most importantly oil. Land suitability studies basically make a matching between land use requirements and existing land characteristics (FAO ). So, this portion of the study focused on assessing land use requirements of jatropha for achieving optimal growth and yield (Table 1). Analytical structure of the criteria (factors) influencing growth and yield of jatropha. Water logged, conservation sites, settlements, cultivated areas, etc. Data source: Existing literature and experts’ views. aSuitability classes indicate environmental conditions in which large scale jatropha production is evaluated. Several studies have examined the correlation between jatropha production and environmental conditions; and there is a consensus that climate, terrain and soil properties are key factors determining growth and yield of jatropha (Jingura et al. ; Wu et al. ; Jongschaap et al. ). To grow well and give high yields, the plant needs enough water, appropriate temperature and altitude; and the soil type has to be right. Ouwens et al. () indicated that ecological conditions do not only affect yield but also determine length and degree of injury by pests and diseases. So, selection of appropriate ecological conditions for proper growth and yield of jatropha was a very essential aspect of this study. Literature review has been conducted to identify environmental requirements of Jatropha curcas based on experiences in tropical and subtropical regions. The information obtained from literature review has been summarized to define the different classes of suitability for each criterion or factor. In Table 1, total range of each factor represents the environmental conditions in which the plant can survive; but production might not be possible across some portions of the range. Literature shows three major suitability ranges for assessing compatibility of an environmental condition for normal growth and yield of jatropha. The plant bears optimum production as long as it grows in the suitable (S1) condition of each factor. Moderately suitable (S2) condition represents friendly situations to support good production of jatropha as far as other factors are not beyond threshold ranges; otherwise, seed setting and production of fruits will be impaired. Ranges of values of environmental variables that fall under the not suitable (N1) category are difficult conditions where jatropha cannot survive unless improvement is made; or if it survives, seed or fruit production may not be attainable. Brief descriptions of factors influencing jatropha production are indicated below. The minimum amount of annual rainfall that jatropha needs to produce fruits is 600 mm (Ouwens et al. ; Grass ). At this moisture condition, the plant will give poor yields. However, the optimal annual rainfall is between 1000 and 1500 mm (Grass ). If it rains more than 1500 mm, jatropha will have problems with fungal attack, root rot and other diseases (Franken ). Thus, rainfall data was classified into three of the suitability classes (S1, S2 and N1). It was attested that if the annual mean temperature is less than 17°C, the area is not suitable for jatropha production (Heller ; Gour ). Low temperature affects metabolic activities that influence germination, growth and development of most tropical plants including Jatropha curcas (Divakara et al. ; Garg et al. ; Liang et al. ). Jatropha establishment requires mean temperature between 17°C and 28°C and seedlings will be injured if temperature is lower than the optimal range (Achten et al. ; Ye et al. ). In contrast, it was observed that very high temperature depresses yields (Gour ; Makkar and Becker ). So, temperature data was classified into three classes of suitability (S1, S2 and N1). Effect of elevation on yield of jatropha is manifested in the damage imposed by frost since frost is a direct consequence of elevation. It was explained by several researchers that jatropha is unable to withstand frost (Heller ; Grass ). Experiences in different countries indicate that the optimum elevation for growth and productivity of jatropha ranges from sea level to 1500 meters above sea level (Muok and Kallback ; Brittaine and Lutaladio ) because at this elevation, risk of frost is minimal. Altitudes from 1500 to 2150 meters above sea level are moderately suitable. All areas above 2150 meters are not suitable for jatropha production because of frost (ICRAF ). So, elevation data was classified into the three levels of suitability (S1, S2 and N1). A soil with good infiltration rates and without water logging tendencies is suitable for jatropha cultivation, while soils with bad infiltration rates and a high tendency for water logging are not suitable. In heavy clayey soils, root formation of jatropha is hindered (Heller ; Brittaine and Lutaladio ; Ouwens et al. ; Biswas et al. ; Singh et al. ; Achten et al. ). The best soils for jatropha are well-drained aerated sands and loams (Gour ; Heller ). It was revealed that jatropha is tolerant to saline soil condition (Sahoo et al. ; Gao et al. ). Jatropha is also known for its ability to survive in very poor dry soils in conditions considered marginal for agriculture and can even root into rock crevices though productivity may be limited (Makkar and Becker ). Therefore, the soil data of the study area was classified into suitable, moderately suitable and not suitable categories. Slope is an important indicator of land suitability since it affects drainage, irrigation and soil erosion (Wu et al. ). Steep slopes reduce infiltration efficiency of rainfall because it facilitates runoff. Slopes up to 15° are ideal for optimum growth and yield of jatropha; whereas slopes between 15° and 30°, exhibit linear decrease in suitability. Slopes greater than 30° are not suitable for jatropha production. Therefore, slope data was classified into three levels of suitability, which is in accordance with similar studies (Achten et al. ; Wu et al. ; Grass ). The national bio-fuel development and utilization strategy clearly indicates that land allocated for biodiesel development must not jeopardize farmers’ food production needs (MME ). Likewise, settlers should not be evacuated; and reserve areas must not be affected by such projects. Therefore, land under cultivation, urban settlements and conservation areas are regarded as not suitable for jatropha production although they are biophysically conducive sites to the plant (Muok and Kallback ; Grass ). Furthermore, jatropha dislikes permanent wetness (Ouwens et al. ); thus, permanent water bodies and wetlands were masked out from land cover (use) data. Woodlands and bush land areas may be converted to jatropha investment given priority sites are exhaustively utilized and thus are considered moderately suitable for jatropha investment (Wu et al. ). Grass lands and marginal land are suitable for jatropha investment. In this research, weights of the selected criteria were derived using SAHP method. A pair-wise comparison matrix of the SAHP is presented in Table 2. Source: Expert interview data and author’s calculation. The numbers in the above table indicate preference (intensity of importance) of the factors being compared based on experts’ opinions. These numbers were obtained during expert consultations for comparing the different factor combinations that affect jatropha production. The weight and CR column values were calculated from the intensity of importance values based on a series of procedures (Saaty ; Triantaphyllou and Mann ). The importance weight is unit-less measure of relative preference of the factors. The weights indicate that rainfall, elevation and temperature have respectively greater importance values contributing more to the overall multivariate analysis. On the other hand, slope, land cover and soil type have importance values less than 10% each. This shows that most of the influence to the resultant suitability comes from characteristics of rainfall, elevation and temperature of the area. These are factors affecting growth performance of the plant and thus are basic to influence analysis of suitability. Furthermore, it is evident from literature that even if there may be variation in performance, jatropha generally grows on most soils except those experiencing water logging conditions. Slope is not a limiting factor for growth and yield of jatropha. Its effect is reflected on soil moisture and fertility status of the land. Both soil moisture and fertility do not significantly influence performance of jatropha (ICRAF ). Land cover is a factor considered to ensure conformity of the results with existing national development strategies; thus, it is not a determinant factor to influence agronomic suitability. Suitability maps of individual factors of climate, soils, land cover and topography are shown in Figure 3. Based on single factor evaluation, landscape characteristics like slope and elevation were found extensively suitable. However, less than half of the land area of the country was found suitable in terms of rainfall, soils and land cover characteristics. Suitability of individual environmental factors for jatropha production in Ethiopia. The results indicate that topographically most part of the country is suitable for jatropha production. It was revealed from this investigation that 97% of the slopes and 65.8% of the elevation of Ethiopia are suitable for jatropha. It was also apparent that high altitude areas and areas below sea level, which account for 34.2% of the landmass of Ethiopia, are not appropriate for jatropha production. On the other hand, it appears that climatic variables are limiting factors controlling growth and yield of the target plant. Effect of rainfall on jatropha production was considerable. This effect is manifested in its influence on germination, growth, seed production and its likely impacts on attracting diseases and pests. In terms of area, a significant amount of the country is actually suitable for jatropha production. However, more than three-fourths of the land is potentially (moderately) suitable with some limitations that may require socio-economic and environmental management mechanisms to make use of them for investment in this sector (Figure 4; Table 3). Suitability map for jatropha production in Ethiopia. 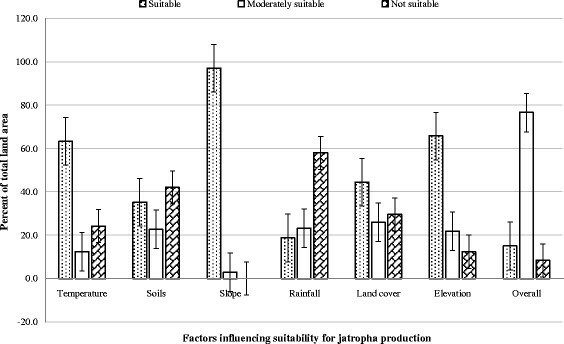 Figure 5 shows interplay of the different factors that affect performance of jatropha. It was found that large coverage of the suitable areas of temperature and terrain factors do not notably contribute to the final suitability index. For example, although 97% of the slope is suitable for jatropha, its percentage influence was minimal (only 3%) in providing more suitable sites in the resultant suitability index. However, rainfall (only 18.8% of which is suitable) has the maximum percentage influence (43%) to the resultant suitability map (Table 2 and Figure 5). Extent of suitability of major environmental variables (factors) that influence jatropha production. The result of the multivariate analysis indicates that 15.07% of the land area of Ethiopia is agronomically suitable for jatropha production. This area refers to biophysically suitable sites that are compatible with the current development strategies of the country (CRGE ). Suitable areas for jatropha production were predominantly attributed to characteristics of rainfall, elevation and temperature with importance weights of 43%, 26% and 15% respectively (Table 2). However, the above suitability evaluation results are just based on natural conditions. Whether or not these lands could be used to plant jatropha is still subject to social and economic evaluation. These results should be regarded as theoretically potential land that could be used for jatropha plantation. But further evaluation of social and economic factors is still important. In addition, it is obvious that suitability is subject to temporal dynamics of environmental variables. Therefore, effect of climate variability and changes in other environmental variables need to be evaluated to plan for future investment opportunities. Careful selection of all the possible variables that affect growth and yield of jatropha is a basic step to make sure that the result will be consumed by decision makers. This research is intended to support investment decision making in the energy sector. Investment decisions must depend on reliable evidence since environmental, social and economic crises arising from an intervention may be devastative or irreversible. Therefore, this study identified and selected potential factors that determine growth and yield performance of jatropha. Climate variables (temperature and rainfall), soil, land cover/use, slope and elevation were identified as the major factors. Multi-criteria analysis techniques were used to integrate the different environmental data in a spatial modeling environment. 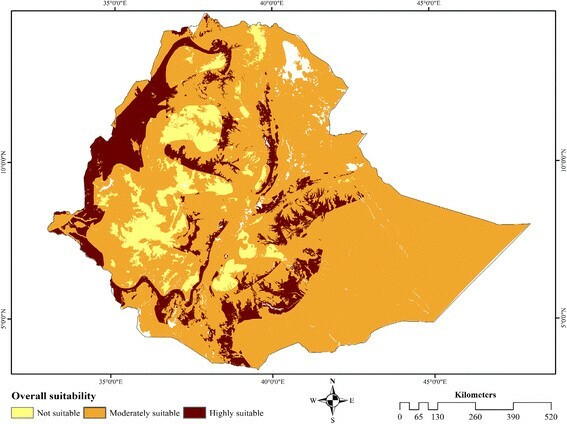 SAHP and GIS were used for mechanistic suitability modeling of jatropha production sites in Ethiopia. This research has introduced these approaches to solve drawbacks of existing conventional techniques like remote sensing and expert opinions or judgments for assessing suitable areas. For studies like this one, mechanistic modeling is preferred over correlative modeling since it explicitly incorporates potential range-limiting processes. For instance, a mechanistic modeling can provide information on proximate constraints limiting distribution and abundance of a species. Classification of the datasets of the identified factors into three levels of suitability enables measuring each factor in terms of fixed suitability classes. This further enabled combination of all variables in a weighted overlay analysis. The classes used in this study were “suitable”, “moderately suitable” and “not suitable”. A “suitable” area in the map shows that the area has favorable biophysical and climatic conditions for successful production of jatropha and is explained in terms of suitability with respect to all the factors considered. A “moderately suitable” area indicates a second priority for jatropha production, which must be allotted for this purpose only after detailed scrutiny of all the factors and decisions on the feasibility of this investment over other opportunities. On the other hand, “not suitable” areas represent those sites that are not appropriate for jatropha growing. They are limited by frost, water logging, inadequate rainfall, scorching temperature, terrain steepness and/ or occupied land cover/use types. The study has shown that there is ample opportunity for jatropha investment in the country. However, considerable attention should be given to proper technologies for establishment, management and processing of jatropha products to get optimum benefit from the sector. Establishment of jatropha plantations should depend on the identified geographic locations to avoid conflicting use interests on a piece of land. Land preparation and agronomic practices must be supported with appropriate technologies. Furthermore, processing industries should be established on appropriate sites based on future trends of plantation establishment. Ethiopia is geographically located within the tropics between 3 degrees and 15 degrees of north latitude and between 33 degrees and 48 degrees of east longitude. It has common borders with Kenya, Sudan, South Sudan Republic, Somalia, Eritrea and Djibouti (Figure 6). There is great variation in altitude ranging from about 116 meters below sea level to 4620 meters above sea level (IBC ; EPA ). The country has an undulating topography providing ample opportunity to satisfy bio-based development interests. The mean annual temperature of the country is 22.2°C. The lowest temperature ranges from 4°C to 15°C in the highlands, and the highest mean temperature is 31°C in the lowlands at the Denakil Depression (Awulachew et al. ). The country receives mean annual rainfall of 812.4 mm, with a minimum of 91 mm and a maximum of 2,122 mm. Relief variability and the resulting climatic characteristics make the country home to a wide range of plant, animal and microbial diversity. Consequently, the country is regarded as a centre of endemism (IBC ; Vivero et al. ). Jatropha is one of the plant species that is traditionally used by the Ethiopian population for a number of domestic purposes. Even though there is no in-depth study of identifying optimal sites for large scale production of jatropha and other oil bearing plants in general, some sources indicate presence of oil bearing plants including jatropha in many parts of the country. For example, castor bean is located elsewhere in many parts of the country. Another oil-bearing plant, pongamia, was introduced by Indians in Beninshangul Gumuz regional state of Ethiopia. Moreover, existing plantations and wildings of jatropha in different areas signify that the country has huge potential for large scale bio-diesel production. The criteria of suitability assessment were selected through an intensive literature review on site requirements of jatropha for optimum growth and yield. Besides review of international experience from literature about the subject matter, expert consultation was a helpful tool used in the rating of factors using pair-wise comparisons. Availability of data was also a key element considered during selection of factors for this study. To compare the criteria, values of each dataset need to be transformed to the same unit of measurement scale. The different input maps (like rainfall, soil type, temperature, etc.) have various units of measurement. Each dataset was converted into raster data format. Pixels of the derived raster data represent values of the different criteria. These pixel values, though having the same unit of measurement scale, were classified into suitability classes for jatropha production. After classification, all raster data of each factor had values of 3, 2 and 1 representing “suitable”, “moderately suitable” and “not suitable areas”, respectively. For determining the relative importance of each criterion in the resultant overlay analysis, a pair-wise comparison matrix using a modified form of Saaty’s nine-point weighing scale was applied (Table 4). If criterion i has one of the above non-zero numbers assigned to it when compared with criterion j, then j has the reciprocal value when compared with i. Source: Modified by the author from Saaty (). For preventing bias during criteria weighing, consistency ratio was used as a tool to ensure coherent comparisons. Consistency ratio is a general measure of the comparative judgments’ goodness in building up decision matrices within the AHP. It was calculated as the ratio of consistency index (CI) and random consistency index (RI). The RI is the random index representing consistency of a randomly generated pair-wise comparison matrix. Consistency ratio is a decision tool to evaluate whether an AHP is acceptable for decision making or not (Saaty ). It was computed from expert preference values using equations (1) and (2). RI = is the consistency index of a randomly generated pair-wise comparison matrix. Values of RI depend on the number of elements being compared (see Table 5). Source: Adopted from Saaty and Vargas (). Therefore, CR = CI/1.24, in this case. Values of consistency ratio exceeding 0.10 are indicative of inconsistent judgments; whereas values of 0.10 or less indicate reasonable level of consistency in the pair-wise comparison. 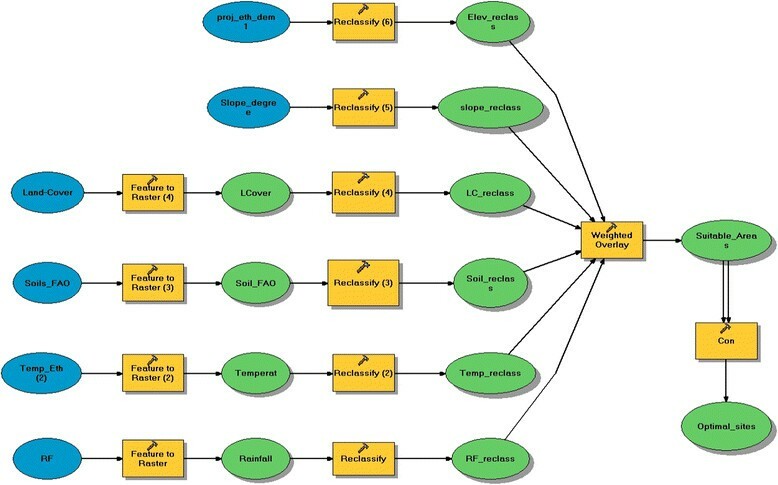 Spatial model was built in ArcGIS (version 10.0); where data format conversion, reclassification and the final weighted overlay analysis were performed (see Figure 7). The various factors (i.e. precipitation, elevation, temperature, soils, land use/cover and slope) were combined to a suitability map of three levels of suitability. In the overall weighted overlay analysis, each criterion was weighed by its importance value, which reflects influence of the criteria in the overall suitability (S). Schematic illustration of spatial model of suitability assessment for Jatropha curcas production. Where Wi represents weight of each criterion (Ci). Different evaluation techniques were applied to make sure that the methods applied in this study were feasible. The first effort was ensuring the factors identified are relevant environmental variables that influence growth and yield of jatropha. This was verified through intensive literature review. Consistency ratio was the other mechanism to ensure whether the factor ranking process was reliable. Moreover, the model was verified with field realities by comparing the model results with location coordinates of actual occurrence data that were collected using global positioning system (GPS). Although the field data collection was not exhaustive, most of the suitable areas identified in this study complied with the field observation data. The model is feasible for the current environmental conditions of the study area. However, if one or more of the environmental variables considered in this study changes, the model result will also be different. For instance, climate change may influence the patterns of suitability. Hence, this study assumes that the resultant suitable sites are identified based on the current environmental settings of the study area. This suitability index is sensitive to any change in the variables. HT has carried out the research design, data collection, analysis, synthesis, field checking and write up of the research paper. The author organized, read and approved the final manuscript. Habitamu Taddese is a lecturer and researcher in Hawassa University, Wondo Genet College of Forestry and Natural Resources, Ethiopia. Habitamu has interest in spatial modeling exercises. I am grateful of the efforts of the late Bayush Dessalegn, my mother, for the fruitful contributions she made to enable such an accomplishment. Let God rest her in peace. The researcher conveys special gratitude to the Ethiopian Meteorological Agency for providing data. I want to thank the Ministry of Agriculture of Ethiopia for additional data provision. I also appreciate the contribution of Mr. Kebede Wolka, Mr. Be’eminet Mengesha, Mr. Yidnekachew Habte and Mr. Solomon Abate who encouraged me to engage in this study. Special thanks to Tatum Branaman for helping in language editing. I also acknowledge the anonymous reviewers and the editor of this journal for their detailed and constructive comments to rectifying the overall structure and enriching the contents of the paper. The author declares that there are no competing interests associated with this research work.